Starting from Teynham station, I find a footpath leading me back to Conyer. This is not the same path as yesterday -that would be boring – but a parallel track leading close to orchards through grass still wet with morning dew. The forecast is good but the sun is still obscured by a morning haze. Straight rows of blossoming fruit trees create grassy corridors, stretching into a misty distance. I reach Conyer and see the Teynham bus waiting there, as it was yesterday. For one moment, I feel caught in a time warp. Nothing here has changed since yesterday. Same bus. Same place. 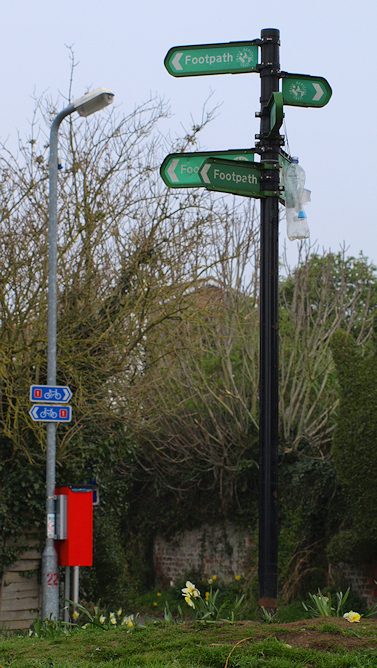 There is a signpost with multiple footpaths branching out in all directions. Despite this helpful sign, I struggle to work out the correct route. 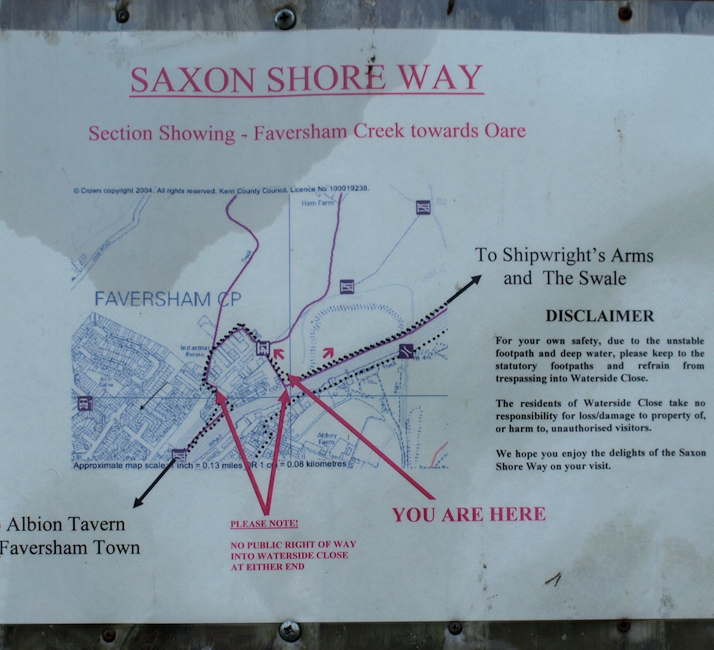 Where is The Saxon Shore Way? I start off. After a while, I realise I must be following the wrong road. I ask a man tending his garden and he puts me right. I walk along a track that passes behind the nice waterside houses I saw yesterday. Then I reach the bank of the sea wall. Wow! I catch my breath. The sea is perfectly and utterly flat. 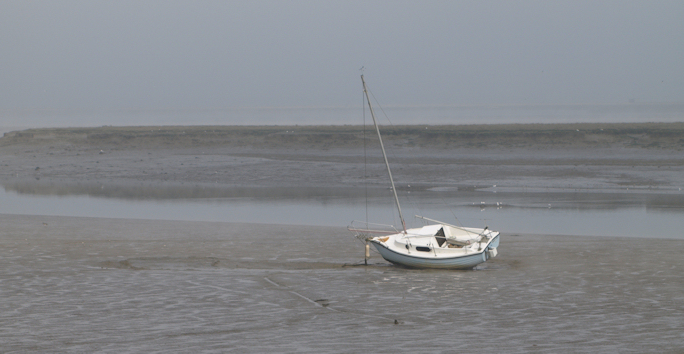 There is a pearly mist hanging over the mud and water beyond. Sky merges into water, merges into mud. A wide green bank stretches alongside the shore, heading past Fowley Island just off shore, eastward towards the open sea. I know there is open sea ahead. But on this beautiful morning, everything beyond a couple of hundred yards is veiled in bright blue-white light. 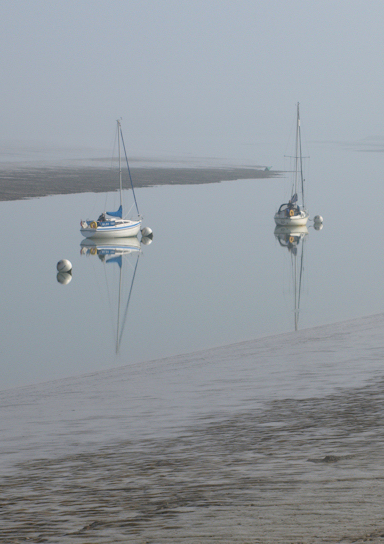 Two moored sailing ships float on still water, each one balancing above its own perfect mirror image. A soft mist rises from the water, and nearby mud, gently drifting inland, towards the bank I am standing on. The light, the water, the mist, the stillness, the clarity of the near distance, the obscurity of the far horizon – so magical. I have never experienced anything like this before. I take photographs, and would have lingered longer, but notice there are people on the ships. A man on one and a woman on the other, standing and talking to each other across the still water, morning cups of coffee in their hands. I feel I am intruding and hurry on. I really enjoy this section of the walk. The bank is wide and curves gently in and out. The ground is firm. The going is easy. The water with its mystical light is on my left. Open fields, stretching to a misty horizon, are on my right. Then I notice a strange sound. It is gun fire. Not the deep bang of a shot-gun, but a more frequent, more insistent, crack-crack noise. Looking at my map, I realise I am passing a rifle range, just inland of here. 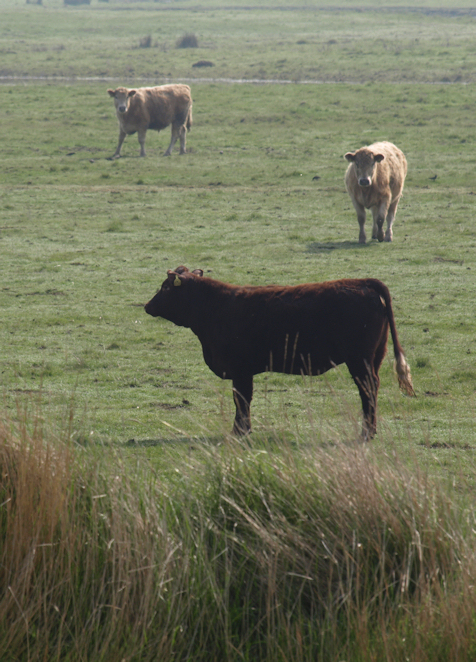 I pass a field of bullocks. They are nosey and come to watch me walking by them. At some point, I sit down on a plank of wood and have a drink and snack. I feel I am making good time and, as often happens when I feel I am progressing ahead of schedule, I dawdle and enjoy the moment – taking photographs, sitting and thinking, watching the water, the light, the mud. As I walk along the bank, enjoying the day, I leave small, muddy, Fowley Island behind. The sky brightens. The sun, still hidden by haze, seems stronger. I pass isolated boats. Across the water is the Isle of Sheppey. 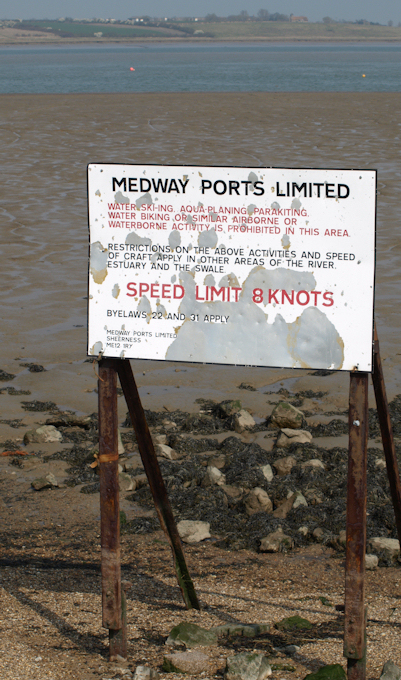 Yesterday and the days before, I experienced the industrial landscape of the western end of Sheppey. Today, the view is blissfully rural. If there are industrial structures beyond, they remain obscured by the distant mist. 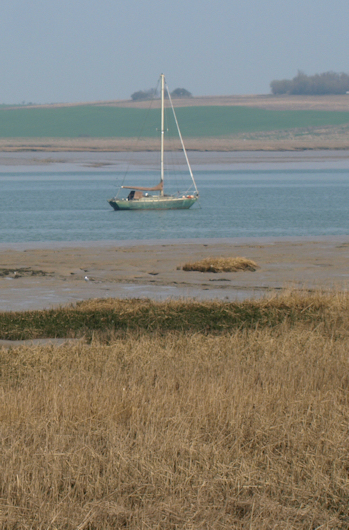 Now I reach the area of Oare Marshes, a nature reserve. A track joins the sea bank (the first road access since Conyer) and there are cars parked with people out, walking along the bank, with pushchairs and dogs. Inland there is a lake, surrounded by reeds, with ducks and swans. The wind has picked up, coming in off the sea in gusts. I shelter in a wooden hide, looking out to sea across mud flats, watching sea birds – and eating another snack. A couple enter the hide, chatting to each other. They see me and apologise for disturbing my bird watching. I confess to only being there for rest and refreshment. 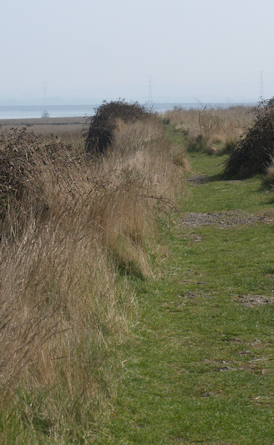 The path turns inland from here, heading down a creek – unnamed on my map, towards Faversham. At the mouth of the creek, the wind blows streamers of mist across the path. Further along, the creek has the usual assortment of fine sailing ships, pleasure motor boats and decrepid working boats. As I walk, I realise I am tired and I am getting cramping pains in my stomach. I conduct a mental check test of everything I have eaten in the past 48 hours, but can’t think of anything that may have upset my stomach. I begin to pass houses and find myself on a small bridge. 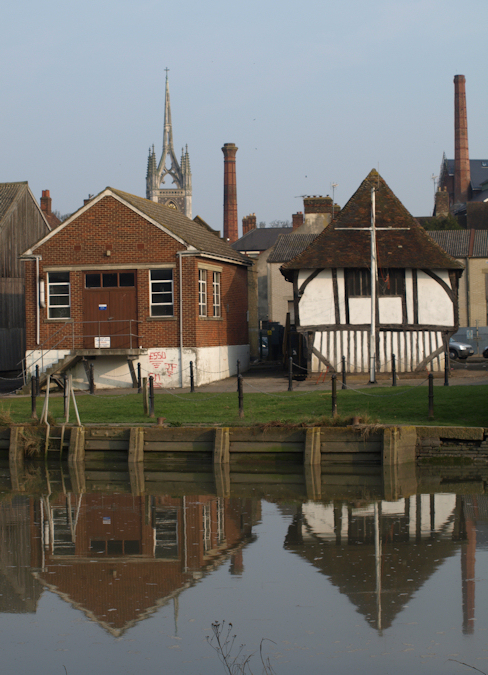 This is Faversham. It is 1:45 pm and I am hungry. Luckily, I spot a nearby pub. It looks closed. I have been misled before; finding pubs converted into private houses, despite still bearing pub signs and being marked on the OS map as PH. There is a man leaning on the side of the bridge. “Is there a pub near here?” I ask him. The pub is, indeed, open. There is a sign up saying “no muddy boots”. I sigh, mentally. Everywhere I go in North Kent, I am surrounded by signs telling me what I can’t do and where I can’t go. Luckily, my walking boots are clean – the ground has been firm and dry. I go in. The next sign I see says, “Last order for lunch 1:45”. On no. I look at my watch, it is 1:46. The barmaid takes pity on me. The cook is about to go home (I see no other food customers) but she will make me a sandwich. I marvel at the fact our pubs are now open long hours and can sell drinks all afternoon, but seem unable to cope with the idea that people might want to eat outside of ‘normal’ eating hours. However, I say nothing, and gratefully accept an exceptionally good ham sandwich. I am unable to finish the sandwich. Stomach pains intervene and I run for the toilet. Then I feel guilty about not finishing the sandwich – after all, it was made especially for me. Surreptitiously, I pull out my snack box and place the remains of the sandwich in there. The barmaid will never know. Now, I am worried about finishing the walk. As my abdominal discomfort subsides, I decide to continue. My plan is to complete a circuit of the Ham marshes, before heading for the train station in Faversham. Over the bridge, and a sign post directs me along the other side of the creek. I walk up past boats and a marina. Every few minutes, cramping pains return and I walk, rubbing my stomach with one hand. Just as I make the decision to turn back, the pains stop. Relieved, I continue. The pains return a few minutes later and keep me company, intermittently, for the rest of the walk. Therefore, I can’t say I really enjoyed this section of the walk – tired and with a griping stomach. Shame, because this was a very pleasant walk. The sun is shining, warmly. I follow the bank around the perimeter of this patch of flat land, surrounded on all sides by river estuaries, with Faversham in the misty distance. The air is full of bird noises. There are sea birds to my left, and land birds to my right. As I approach Faversham, again, I meet a man walking very briskly towards me, with his dog. At first glance, I think he is out for a walk. He keeps whistling to the dog, a black mongrel, who keeps running back, away from him, down the path towards a tent, pitched beside the bank, close to a perimeter wall. The dog clearly prefers the tent to the walker. There are three men standing by the tent. I assume the tent has been pitched by fishermen; not uncommon on the coast. Drawing nearer, I realise there is a minor drama unfolding. Two of the men, by the tent, are uniformed police officers. They stand, tall and large, with their fingers hooked into their belts and jackets. One of them draws out a notebook. The third man is short and skinny, stooped shoulders and with a guilty look to him. The dog returns to lick the skinny man’s hand, and then disappears in the direction of the walking man, who is disappearing quickly into the distance. I notice the tent is not full of fishing equipment, as I initially assumed, but contains a rolled up sleeping bag and some personal effects. Putting two and two together, I decide the young man is sleeping rough (albeit with a tent). Somebody has reported this to the police and he is being ‘moved on’. The other man (now a dwindling dot in the distance) was probably his companion, but has decided to scamper off. I feel sorry for the skinny man. Somehow it seems wrong to take photos of this sad scene. So I resist and walk on. Now I find the path barred, with the usual assortment of notices telling me I can’t pass here. New buildings have been put up along the bank of the creek and, although it would appear the path was diverted to a walkway alongside the water, the foreshore has been eroded by tides and the path has disappeared. I feel angry. How can a new footpath have been so easily lost? What were the planners thinking in allowing an important section of The Saxon Shore Way to be destroyed? And why can’t I walk through this new housing area? Now I have no choice. A map shows the detour I have to make. It is not far. But the detoured route follows the perimeter fence of an industrial area and the walk, once so scenic, is now the usual grim stroll alongside high fences warning me not to trespass and, in case I was tempted, reminding me that I am being watched by CCTV. Perhaps it is the tummy pains, still coming and going, or perhaps it was the sad scene with the homeless young man I just witnessed – but I feel unusually aggrieved by the detour. Come on Swale District Council. Come on Kent County Council. If you want to create a nice long-distance walk, then, for heaven’s sake, get it right! 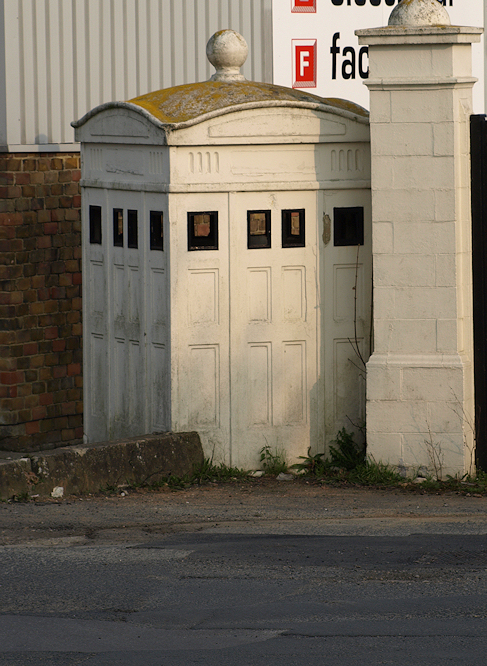 The only good thing about the detour was the strange Tardis box I came across, guarding the access to the ‘private’ housing area and the industrial estate. If I was Doctor Who, I would abandon the little blue box for this one. I reach a road. Looking back along the river, I see the housing area which forced my detour. Although it looks lovely in the setting sun, internally, I half wish the blasted new houses will slip into the river, following the footpath into the watery depths. Ahead of me, Faversham looks lovely. But my feet are tired, my stomach hurts; I don’t want to wander any further than I need to. I seek directions, constantly, from every passerby I come across. I walk through a pleasant town centre – coffee bars, interesting shops with art, books and antiques, people out strolling – yes, this is a very pleasant town. The first truly nice town since I left the centre of Rochester. At the station, queuing for my ticket. Two small, anxious boys approach me. I guess they are around ten years old. They have middle class accents and are dressed in clean clothes. Is it wrong to find myself more sympathetic to their plight because they are middle class boys? I don’t ponder too long. I give them two pounds. They buy their tickets and run back to me to give me the change. I ask them if they have enough money to get home. They nod. Safely seated in the train, I clutch my grumbling stomach and think about the events of the day. After a beautiful start, I got caught up with annoyances and dramas – my tummy ache, the pub with no food, yet another forced deviation to the path, the homeless young man with the policemen and the anxious young boys without enough money for their fare home. People ask me if I get lonely or bored on my walks. Health update: That evening, on my return home, I felt very ill indeed; nausea, diarrhoea and crampy pains, along with the shivers and a headache. I had a much-needed bath and went straight to bed. It was some sort of bug, from which I took 48 hours to recover. This entry was posted in 05 Kent and tagged coast, hiking, photography, travel, walking. Bookmark the permalink. we decided to ‘do the Isle of Sheppey, which must have the cheapest housing in the UK..8,999pounds for a home. Shellness to Sheerness was actually great, as the tide was out.. there was a 4+ Mile stretch under clay cliffs, where we actually found fossilized dinosaur bonds etc… quite remarkable to just see them lying there. There were also awesome views of the submerged ship full of explosives in the Thmes estuary just off Sheerness.. they don’t dare move it apparently in case it blows out all the windows on either side of the estuary. The walk is about 4 hours.